Have you had a chance to try a macaron? These delicate and delicious traditional French style cookies are now available at The Sweet Cake Company! Flavors shown are raspberry and cookies and cream. These make a perfect addition to your party or an elegant wedding favor. Custom orders available. 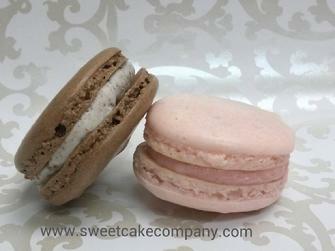 Macarons can be orderd by the bakers dozen for $21. Please contact us for ordering information!